New rugged, ergonomic gun is the lightweight, effective spot cleaner! 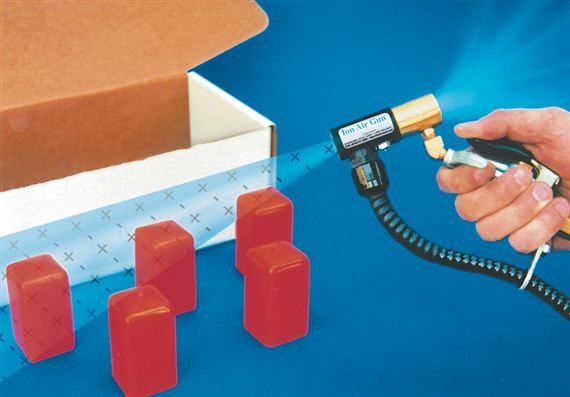 What is the Ion Air Gun? This new Ion Air Gun combines incredibly fast static decay rates with low compressed air consumption. It is the ideal way to remove static, contaminants and dust from three dimensional parts prior to assembly, packaging, painting or finishing. The Ion Air Gun neutralizes static electricity and cleans at distances up to 15 feet (4.6m). Why the Ion Air Gun? The Ion Air Gun induces surrounding airflow through the gun at a ratio of 5:1, minimizing compressed air use and maximizing ionized airflow. The force can be adjusted from a “blast” to a “breeze”. A comfortable grip and hand position allow hours of continuous use without fatigue. The Ion Air Gun is quiet, lightweight and features a hanger hook for easy storage. The 10 foot (3m) shielded power cable is extremely flexible, designed for rugged industrial use. Electrical: For use with 5 kVrms, 5 milliamperes (max) power supply, Model EX7960 (115V) or EX907 (230V). Power supplies are UL Listed, CSA Certified. Electrical Hazard: Shockless (less than 40 microamperes short circutied). Do not use near flammable materials or gases.